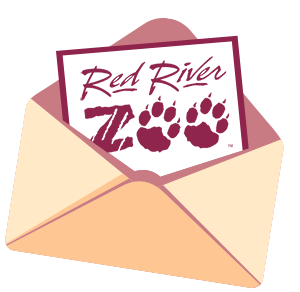 As a method of tracking the use of this web site, www.redriverzoo.org may utilize the web technology known as “cookies,” which enables RRZ to relate a visitor’s use of RRZ information to any information that the visitor may have specifically and knowingly provided to RRZ. Any such voluntarily provided identifying information, if applicable, may be used by RRZ for editorial, marketing or promotional purposes. Such identifying information, if applicable, will not be transferred to any other party unless otherwise stated at the time of collection. RRZ only collects personally identifying information to the extent that it serves our legitimate business purposes, and RRZ will maintain appropriate safeguards to ensure the security, integrity and privacy of the information. You can shop at www.redriverzoo.org with confidence. We have partnered with Authorize.Net , a leading payment gateway since 1996, to accept credit cards and electronic check payments safely and securely for our customers. redriverzoo.org is registered with the Authorize.Net Verified Merchant Seal program. RRZ does not offer refunds on admission, memberships, educational programs, or special event ticket purchases. Purcahses from the Wild Things Gift Shop are refundable when the original receipt is presented within 30 days of the purchase date. All items will ship out within two days of purchase, unless otherwise noted. We determine the most efficient shpping carrier for your order. The carriers that may be used are: U. S. Postal Service (USPS) United Parcel Service (UPS) or Federal Express. UPS and Federal Express deliveries occur Monday through Friday, excluding holidays. If you require express or 2-day shipping, please call us at 701.277.9240 for charges. No taxes or shipping or handling costs will be added to membership purchase, event registration, or special event ticket purchase. Shipping costs are based on USPS flat rate shipping fees. Out-of-state orders from the Wild Things Gift Shop will not be charged sales tax. A 5% sales tax will be applied to all North Dakota purchases.